Nimble Storage’s opening day wasn’t too shabby. The storage vendor started the morning at $31.10 per share, up nearly 50 percent from the $21 opening day share price set Thursday for a total expected take of $168 million for 8 million shares and a valuation of $1.48 billion. 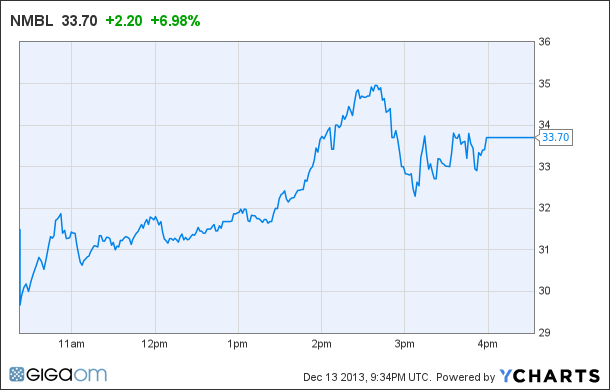 Shares traded as high as $35.13 before settling in to close at $33.93, up 61.57 percent on the day. San Jose-based Nimble, trading on the NYSE under ticker symbol NMBL, makes hybrid storage systems that mix fast flash drives with more traditional (and less expensive) disk drives, knitting them together with management software. In storage overall it competes with all-flash players like IPO-bound Pure Storage and Nimbus and EMC’s new XtremIO flash arrays as well as hybrid arrays from EMC, NetApp(s ntap) and others. A pretty good day for who ??? Sure the investors who got in at a low share price but not Nimble Storage. They left over $12 a share on the table by pricing their opening too low. Exactly. Why is it reporters never get this right?